As regular Bleeding Cool readers will know, we’ve celebrated a number of important 75th anniversaries in recent times. Superman’s 75th anniversary was in 2013, Batman’s 75th anniversary was earlier this year, and we even noted Blue Beetle’s 75th anniversary recently. It’s hard to overstate how important the year 1939 was in laying the groundwork for the comics industry as we know it today. By the second half of the year, DC’s early success had become obvious to several other publishers, and the race was on to get competing titles onto the newsstand. 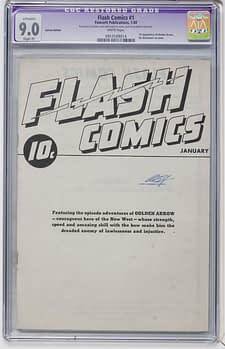 On August 1, 1939, All American Comics, Inc (the sister company of Detective Comics, Inc, and run by legendary industry pioneer Max Gaines in partnership with DC’s Harry Donenfeld and Jack Liebowitz) published an ashcan comic to secure the trademark for the Flash Comics title. 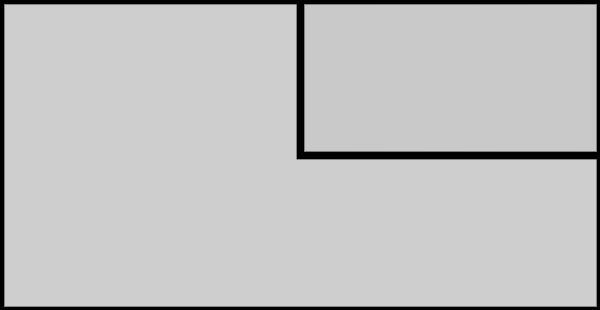 An ashcan was essentially a mocked-up publication used specifically for this purpose, and typically only a handful of copies would be produced. 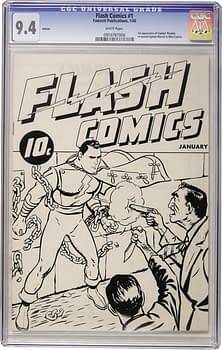 Please note that August 1, 1939 is not the date of the first appearance of the Flash. Ashcans were hastily put together items to secure the trademark on the title, and often did not feature the characters that would ultimately appear in those titles. Usually, they’d simply use artwork that was already done or which had appeared elsewhere. 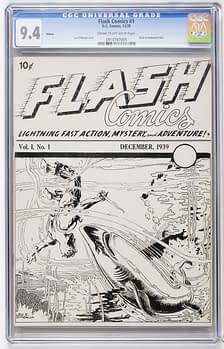 In this case, the Flash Comics #1 ashcan features the cover art from Adventure Comics #41 and interiors from All American Comics #8 (as an interesting historical aside, since All-American Comics #8 likely hit the newsstand in mid to late Sept at earliest, this does probably mean that those interiors were published in the Flash Comics ashcan before they appeared in All-American). Sometimes, publishers would send a few copies to distributors or wholesalers via registered mail to establish a verifiable date of publication. But DC Comics’ All American branch was not the only publisher who wanted to put out a title called Flash Comics. Fawcett Publications, a longtime successful publisher of magazines of various types, was about to enter the comic book field and also wanted to lay claim to the title, to debut the character who would become known as Captain Marvel. The accepted version of subsequent events — which ended up with Fawcett trying (and failing) to secure two different titles before settling on Whiz Comics — has always been somewhat vague, but I believe we can start to clarify the timeline of this sequence of events now. There are two different versions of Fawcett’s Flash Comics ashcan. One which has no cover art and contains a story featuring the character Golden Arrow, and another one which actually does feature Captain Marvel (initially called Captain Thunder in the ashcan) on the cover and interiors. 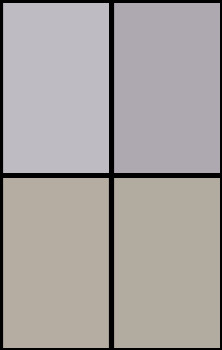 This suggests a very hastily produced initial version followed by a more finished second version. 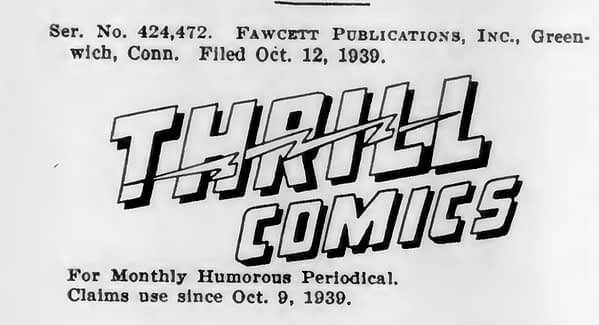 About October 1939, Fawcett, which had previously published only detective stories, began the work of preparing for publication of a new monthly comic magazine, to be entitled “Whiz Comics” and to sell for the same price as “Action Comics”. Taking that at face value, Fawcett had likely lost the race before they even got in it. 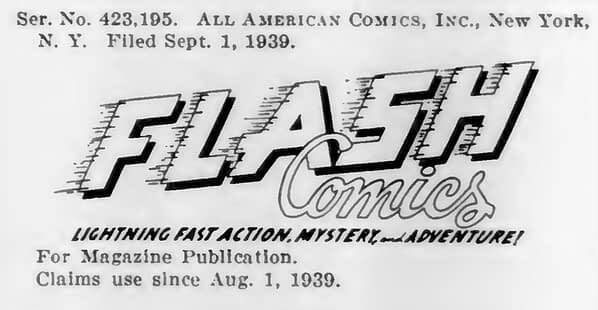 Though there is no specifically-dated evidence of the attempt by Fawcett to register Flash Comics, Captain Marvel’s lightning bolt iconography strongly suggests that they would have attempted to use Flash Comics before moving onto Thrill Comics, and the timeline as a whole appears to indicate that the second version of their Flash Comics ashcan was produced in early October or perhaps late September at earliest. I can’t be down-to-the-day precise about the date of the first version of the ashcan, but the idea that they moved from the first version of the ashcan to the second version before they realized that they’d lost the race suggests a relatively quick sequence of events, and almost certainly, it came after September 1 (the date of DC’s actual filing). We do know for certain that they realized they had lost the race for the Flash Comics title by October 9, because that is when they published the Thrill Comics ashcan. Of course, they’d ultimately lose this one too — even though they got to the “published for opposition” stage with the U.S. Patent and Trademark Office with this attempt — but much more about that next time. Co-founder and Creative director of Bleeding Cool parent company Avatar Press. Bleeding Cool Managing Editor, tech and data wrangler. Machine Learning hobbyist. Vintage paper addict.